This is a very rare opportunity to own this 6 speed top spec example finished in white. Just some of the main features are : All Previous MOT's Supplied For Mileage Verification---Comprehensive Service History ---18 Inch Unmarked Alloys ---R Design Embossed Half Black/White Suede/Leather Interior---Remote Window Opening and Closure---Electric Heated Mirrors---Cruise Control---Multi Function On Board Computer---Dual Zone Climate Control---Air Con---Radio---CD---AUX Input---Handsfree Through AUX---Bluetooth Phone Parrot MKi9200---Multi Function 3 Spoke R Design Embossed S.Wheel---Height Adjustable Seats / Adjustable Lumbar Support, ISOFIX Ports---Colour Coded Boot Spoiler---Colour Coded Bumpers/Handles/Flared Side Skirts---Colour Coded Extended Wheel Arch Mouldings---Brushed Chrome Effect R Design Mirrors---Follow Me Home Lights---Panic Alarm---Auto Headlights---Auto Dimming Mirror with Compass---D5 Twin Tail Pipes---Inflation Tool Kit---Locking Wheel Nut---Full Hand Book Pack---2 Remote Keys Any inspection as always is most welcomed and we are happy to do you a full walk around and talk tour of this car, also a live walk around video is available. You can live chat us anytime at your convenience on our website. Buy with complete peace of mind knowing that you are buying from a fully affiliated Dealer that has been well established since 2003 with over 30 years experience in the Motor Trade. We look forward to your call. The C30 hatchback from Volvo is enjoyable to drive, and as you'd expect, features a comfortable and refined cabin. 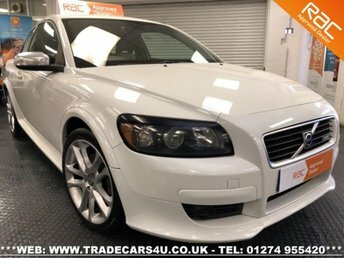 If you're in the market for an attractively priced hatch then be sure to take a close look at the range of used Volvo C30 models for sale in Cottingley, Bingley today. Here at Trade Cars 4 U we offer an excellent array of vehicles, each of which is put through a thorough inspection process before going on sale. Call the showroom now to discuss your requirements in more detail, or to organise a test drive in the vehicle of your choice.